There are days when I just feel powerless. Helpless in the face of all that life is bringing to me. Friends in pain and I’m unable to stop the hurting. Hearts broken when love is denied and all I can do is watch. Growing pains in the “new” reality of life, adjusting to the unwelcome changes. I can only watch in confusion as the “bad guys” seem to succeed and the “good guys” suffer. I’ve learned that pain forces me to move, to change and to grow. To endure. I’ve realized that not all love is good. There’s wisdom in the saying “It’s better to have loved and lost than never to have loved at all.” Broken hearts do mend. There will always be scars and fears. And, we learn to use caution before giving our hearts away too freely, too easily. I try to accept and adjust to the new reality that each day brings to me. Because, what choice do I really have? Change may not be welcome, but it is inevitable. Change is often GOOD. Instead of fighting every change, I’m trying to move on with grace and acceptance. I still question the fairness of life. I struggle with forgiveness. What does it look like? What if no one asks for it? Do I really have to forgive and forget? Ultimately, God is the only one that understands the reasons. I have to turn it over to Him on a daily basis. Yesterday I put flowers on my husband’s grave. I do this whenever I make the trip home. For eight years I have brought new silk flowers to fill the marble urn on the headstone that marks his little plot of ground. There are people that think this is a waste of time and money. 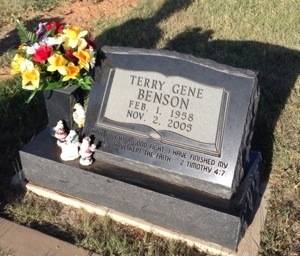 Terry doesn’t know or care if there are flowers on his grave. Actually, Terry didn’t see any reason to spend money on flowers when he was alive. The irony never fails to amuse me: I’ve put more flowers on his grave than he ever gave to me during our marriage. And I’m ok with that. To be clear: I don’t put flowers on his grave to make Terry happy. I know Terry’s not in that cemetery. It’s just his shell that we buried. I do it because I want anyone that passes his gravesite to know that he was important to someone. Flowers are the only way I have left to say he was loved. It’s the one place that allows me to openly honor him. I will continue to refresh the bouquets as long as I can, in memory of the husband and father that Terry was. In memory of the love that I cherish to this day.